A Weekend With GAZZO! | Have you Heard? — Escucho? He is recognized as one of the top five magicians in the world. Unfortunately, he was struck by a massive stroke and lost his hand dexterity. While he lay on the hospital bed with all kinds of tubes and beeping machines, doctors told him he would never be able to do magic again. But Gazzo’s magic came to the forefront. Gazzo persevered through his physical limitations and depression the stroke brought in his life. After relentless practice, dedication, and resolve he rose back like the Phoenix from the ashes. Lo and behold he came back as an even better magician than he was before his stroke. In his career, he has performed more than fifty-four thousand shows and entertained a live audience of over 15 million people! 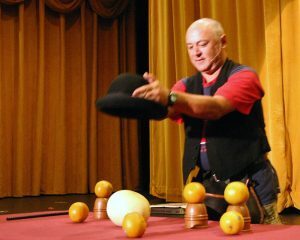 Amongst his magician peers, Gazzo is considered to be the magician who has performed in front of the most number of people on earth. His audiences around the world have rated his shows with 98% satisfaction. He has entertained up to 5,000 people at a time in casinos in Las Vegas, performed on Penn & Teller’s Fool Us on national TV, performed at Universal Studios, trained thousands of fellow magicians at magic conventions, and entertained hundreds of people per show in his street performances. He’s trained thousands of magicians in his style of magic and is also a published author of three bestselling books. There has been a movie made on Gazzo’s life and its spellbinding magic. Al Pacino, Halle Berry, Carmen Diaz, Steven Spielberg, Manny Pacquiao, Roy Schider and former world boxing champ Wladimir Klitschko are some of the hundreds of celebrity fans he has entertained. Lance Burton, David Blaine, Johnny Thompson, Maria Ibanez, Penn and Teller are some of Gazzo’s peers who vouch for his extraordinary talent of leaving your jaws drop in awe while you pee your pants, simultaneously. Now that I have your attention, this is your opportunity to spend a weekend learning and/or honing up your street entertaining and busking from the master himself! Gazzo is conducting a private weekend 3 Day workshop Friday November 9thto Sunday November 11th, in sunny Miami! This is a private, in-person event only and won’t be broadcast. This will be billed as a “Weekend with Gazzo” The workshop is limited to 9 spaces. It no doubt will sell out very fast! You’ll be in a small group where you’ll REALLY meet one of magic’s greats, and get 1-on-1 hands-on help as he teaches you his VERY favorite magic tricks with a FOCUS on Street Performing and Busking. The value of this experience is truly immeasurable. The workshop will include the use of the materials. You will have access to cups and balls, a pouch, and tables so you will get to focus on and get 1 on 1 help without having to worry about bringing the necessary props. The days will be a nonstop thrill ride of learning, excitement and magic secrets. This is a boot camp where Gazzo will download his knowledge right into your brain. Lunch and Snacks will be included! You will have a working lunch where you can ask any questions you like! It’s gonna be 3 days of wonderful. We will be making arrangements with a nearby hotel to make your stay easy and comfortable as well as affordable for you, the cost of the hotel is not included. For questions, costs, or further details please contact Maria at 786-258-8762 or Adrian at 305-297-2395; they will get back to you promptly if they cannot respond immediately. You may contact via email at merlina17@aol.com. Looking forward to seeing you there. It is going to be a weekend of fun and lots of learning. More details to follow soon!